Happy Friday friends! Today is all about sales because there are some good ones going on, so let's get started! 1. 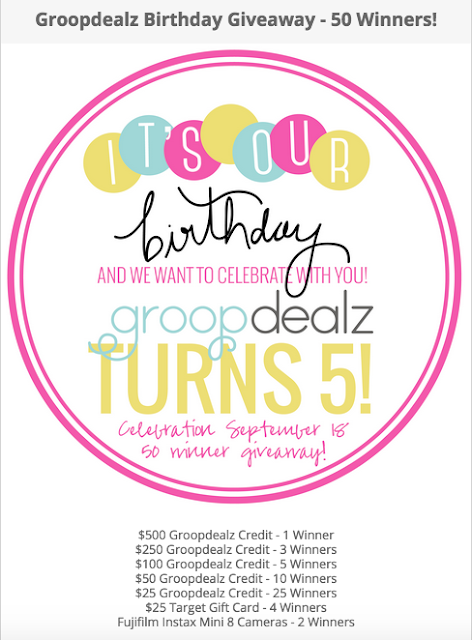 Groopdealz is turning 5 and is celebrating BIG! Not only do you get 15% off with the code BDAY15, you also have the chance of being one of the 50 giveaway winners! You can enter the giveaway HERE and shop HERE. 2. Gymboree: Gymboree is 40% off regular priced items! Perfect for when you have to buy 2 of everything ;) You can shop the sale HERE. 4. Pink Blush and Pink Blush Maternity: PB and PBM are 20% off with the code FALLPREVIEW. You can shop Pink Blush HERE and Pink Blush Maternity HERE.